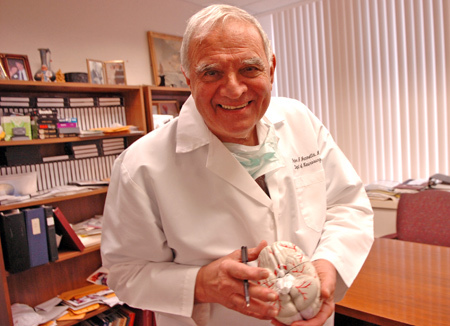 One of the world's great pioneers in neurosurgery, Dr. Peter Jannetta, passed away April 11, 2016. Please take a few moments, click on the underlined words that follow and view this video honoring Dr. Peter J. Jannetta, M.D. This was shown October 13, 2007 at the David Lawrence Convention Center, Pittsburgh, PA (produced by Allegheny General Hospital, Pittsburgh, PA) at an event honoring Dr. Jannetta's career and pioneering contribuitons. He was truly a great teacher and a father figure to many of us who trained under him. We will miss him dearly.